High Tea: Is Having Breakfast A Must? Are you the type of person who really takes breakfast regularly? I'm not! In fact, I always skip breakfast especially that I work on shifts and also because of my irregular sleeping patterns. But I've been constantly hearing from health experts that breakfast is a must for everybody and in fact, it is the most important meal. As for myself, I take breakfasts when I have the opportunity because of my busy schedule at work, but most of the times, I just take coffee or light sandwiches or biscuits. But come to think of it, what really are the benefits of having a good breakfast every morning? According to Kathleen M. Zelman, MPH, RH, LD, eating a healthy breakfast can be linked to so many health benefits including weight control and improved performance. Studies also show that people who take breakfasts have better concentration, problem solving skills and hand-eye concentration. I am actually guilty of not having breakfast most of the time and I am also saddened with the fact that I wasn't able to impose this very important meal in the house. Both my kids are not heavy breakfast eaters. This is so, because they have an early morning class and they are always in a hurry to leave the house. The most that they can take is a cup of Milo or coffee plus cereals or at times, they would have a very small serving of sandwich. When we had our trip to Bangkok last month, I regret not having them get used to having breakfast every morning. 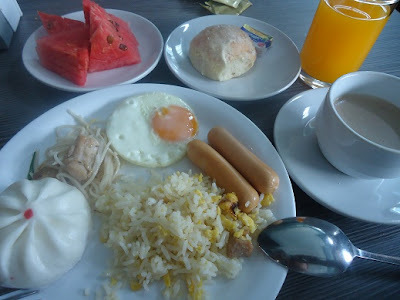 You see, the hotel is providing a breakfast buffet and that's included in our room charges but I could see them both just having a very little amount of breads and noodles plus few slices of fruits. Contrary to what most people are saying, traditional breakfast of eggs is the best way to get that much needed morning protein and can help you get energized the rest of the day. Since, I am now very determined to practice a more healthy lifestyle, I am now thinking of strictly having breakfast every morning and would also encourage my children to do the same. How about you? Are you a breakfast eater?